Now the only remaining member of the 'Swiftsure' class of Fleet Submarines, SCEPTRE was seen as she left Loch Long this afternoon, for sea. 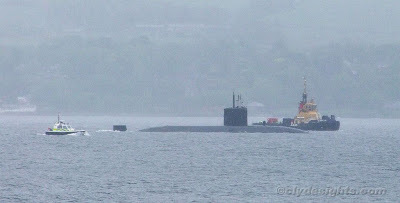 SCEPTRE has recently completed a major maintenance period at Faslane, where she is based. She is the oldest seagoing vessel in the Royal Navy, having originally been commissioned in 1978, and is due to leave active service in around eighteen months time.